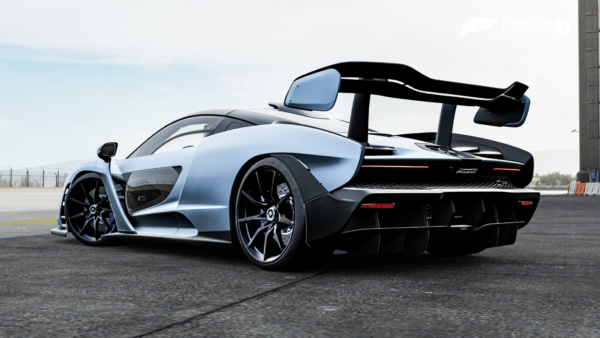 When word arrived that Evolution Studios alumni would be joining forces with Codemasters, racing game fans were intrigued by what would come next from the studio. With a portfolio that includes various original IPs and some of the best WRC games ever, Evolution brought serious talent to Codies that could be used for its various existing IP. 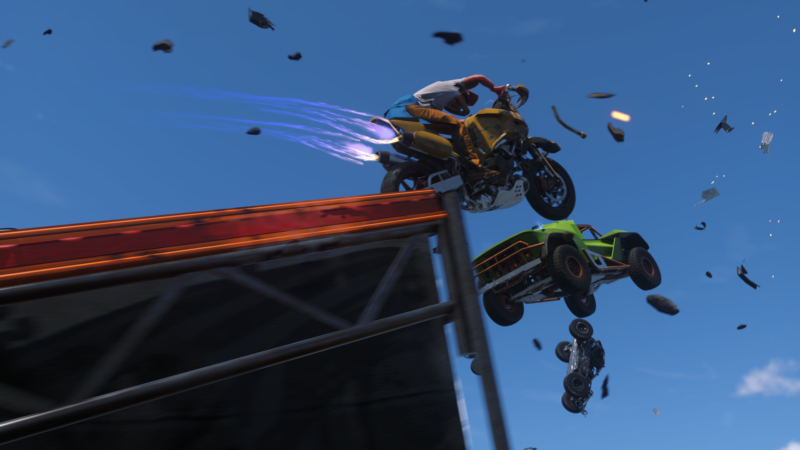 However, in November 2017, the wraps were taken off OnRush – a brand new series that looked deceivingly like a certain Sony exclusive franchise. In the months that followed, pessimists complained about how the game wasn’t Driveclub 2 or Motorstorm whatever-we’re-at and this heightened as Codies dropped the bomb that OnRush was far from a traditional racing game. 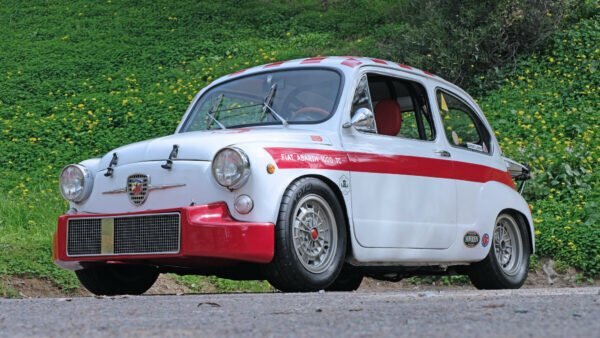 No finish lines or positions, but instead a team-based objective mechanic, ruffled the feathers of purists everywhere. 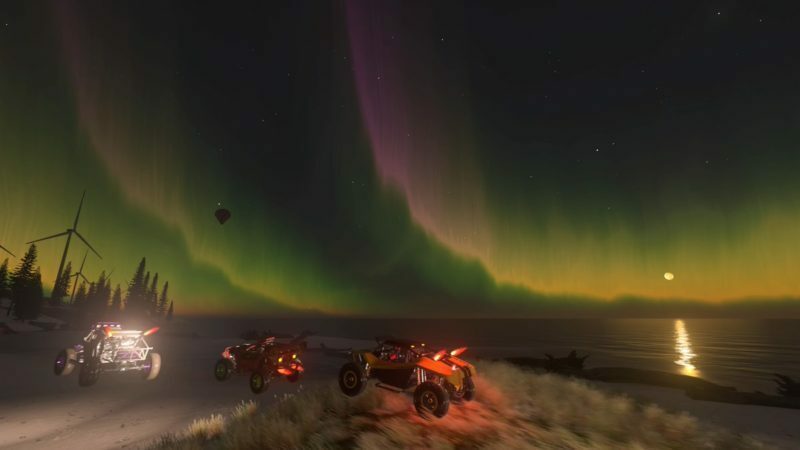 There’s no doubt that the arcade genre desperately needs a shake-up from the fairly standard off-road affair found pretty much everywhere, but does OnRush deliver as a much needed shot in the arm for a stagnating area of our favorite genre? OnRush is a vehicular-based combat team objective game. It sounds like a mouthful but that’s the most succinct way I’m able to describe it. Players compete in a variety of modes that test not only their ability to pull off mental stunts and avoid danger but also work together as a unit to secure victory. 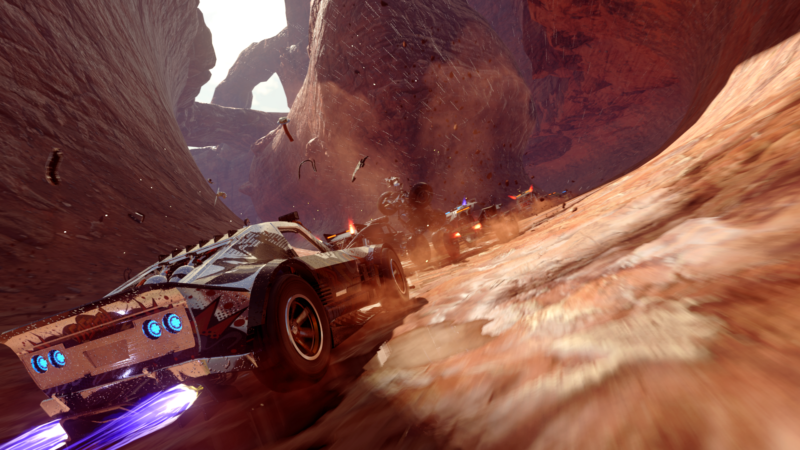 Currently, OnRush consists of four gameplay modes. Overdrive is a score-attack that borrows from the likes of SSX, and Pure to name a few comparisons. The goal is for each team to reach a certain score total before the other, usually in a best-out-of-three format. Countdown is a mode that is going to appeal to fans of the racing genre the most, offering a twist on the timer-based arcade racing games of yesteryear. Drive through gates with your team to replenish your timer bar, and keep yours going longer than the opposition to win. Switch is a unique reversal on Call of Duty’s popular Gun Game mode. Players start off as a lightweight bike and have to survive for as long as possible. Each time someone takes you down, the game gives you a more substantial vehicle to wreck havoc with. The team who survives wins and it makes for some exciting (but long) battles. Finally, Lockdown is essentially a fast-moving King of The Hill. A zone moves across the map and the team who can put the most vehicles inside it for five straight seconds wins the match. These modes are spread across a meaty online experience (which we’ll discuss later) and a surprisingly extensive single player. Given all the messaging prior to release, I was under the impression that single player would be a tutorial to introduce players to the real event. However, OnRush‘s SuperStar mode is a fairly large chunk of game. Spread across six distinct categories, players will be tasked to beat each event included within and also meet special objectives. It’s fairly standard arcade game fodder but still a lot of fun. There’s even a minor story that’s told from event to event with some great visual design thrown in for good measure – a returning trait more fondly remembered from the PS2 era. One major plus point is that up to six people can party up and take on the entire experience in co-op. It’s a painless process that works incredibly well. Even better, some challenges in the mode distinctly point out you can clear them as a party to reap the rewards. So if you’re bad at getting takedowns in a certain vehicle, your friend can do the leg work whilst you focus on getting the W.
Eight main classes feature in OnRush with plenty of different shells and liveries to unlock for each. Similarly, customization is in-depth with players able to change up everything from the vehicles, characters, profile banners and tombstones. You can purchase most items with the in-game currency earned from playing the game but OnRush also incorporates loot boxes to keep a certain freshness. These are gifted out very frequently each time you level up. Other items are also earned by completing objectives in Superstar mode. There’s hundreds of options here cosmetically but don’t expect much in the way of gameplay modifiers. It’s all strictly about style. 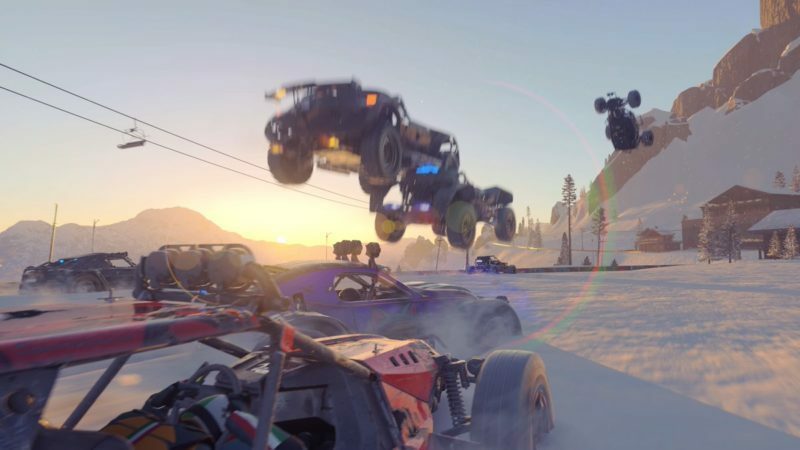 There are 12 main tracks on which OnRush‘s stampedes takes place. Each is widely varied and has its own unique spin. Where one might take place on a clone of the Grand Canyon, another takes you on a rip-roaring tour of a seaside resort, complete with golf course. One of the main criticisms levied at the game was that the tracks appeared to be very straight forward. There’s a few technical tracks in here that buck that trend and with the vertical element included in each, every lap feels different. 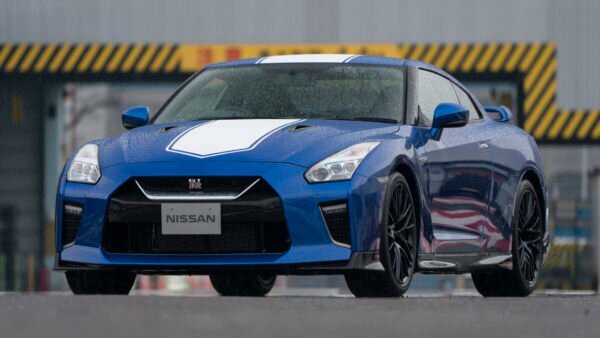 Just don’t expect tracks like the Nurburgring or any turns like Eau Rouge. The game modes of OnRush have a lot of hidden elements that keep each round interesting. For example, Overdrive isn’t simply about earning points, it becomes more about meter management the better you get. Alongside that objective keeping a large combo is key, but so is stopping your opponents and so is making sure you pass off your vehicle’s passive abilities to teammates who happen to be right in the thick of the action. That’s without mentioning that your Rush meter acts as a multiplier you can pop to increase your score. This is just one example of the layered depth OnRush‘s gameplay modes have. Lockdown feels like the most complete of the modes included because it puts the stampede in a contextual scenario. Everyone is fighting to control a single area and winning takes a combination of vehicles and abilities used intelligently. One huge improvement after my worry from the beta is that OnRush has a large selection of tutorial videos throughout. In the pre-release test, it seemed like the game left you to your own devices to wade through confusion before it clicking hours later. Here, in the full release, there’s a lot more focus on each vehicle’s abilities and each mode’s nuances. I’m no longer as worried about people not ‘getting’ the gameplay loop. It will still take some time, but there’s a huge improvement here. The foundations are here for a solid content list and Codies promises future additions. Just be aware that what is here isn’t really supposed to endear the solo gamer. Single player is fairly weighty but it’s a standard affair found elsewhere in the genre. As a side note, OnRush seems to be always-online based on numerous disconnects that stopped my single player experience. This was a rare occurrence, however. 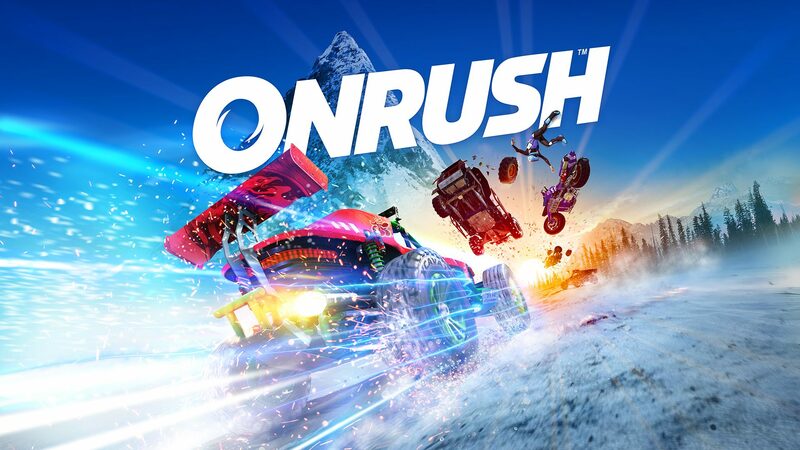 Online is the main event as far as OnRush is concerned. The team-based gameplay encourages you and your friends to become an unstoppable force within the stampede, and there are multiple options to dive into. The party system is incredibly straight forward and really makes proceedings a lot easier than most other offerings in the genre. From any menu screen, simply press triangle and players from your friend’s list with OnRush can be invited. That’s it. No need to set up a private lobby or suffer through an elongated setup. The reason for this incredibly easy set-up is that pretty much everything in OnRush can be played with your friends. The entire SuperStar career can be played through with a party of six (as discussed above) and more traditional multiplayer can be accessed in playlists or custom lobbies. Speaking of the multiplayer, OnRush keeps things simple with two main modes. Quick Play does what it says on the tin, cycling through all four modes and maps with no competitive tracking. Competitive Seasons are present in the game but currently sit behind a “Coming Soon!” banner. Given this will probably be the driving force behind the longevity of OnRush, I can’t wait to see what’s in store. Similarly, I also can’t comment on how in-depth it is for the time being. 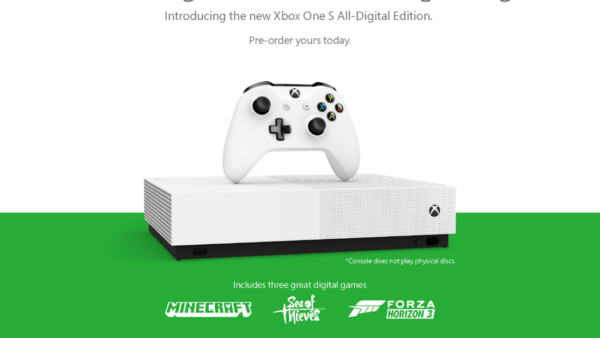 Despite the clear guide towards online multiplayer, that about describes the features available. The gameplay is the star and as such, there’s no multitude of options or menus to get lost in here. Click a few buttons and you’re in a game. The swiftness of the matchmaking really is impressive when combined with the lightning quick loading times. It’s a real commendation to Codemasters just how well OnRush handles getting a player into the action. At the end of every match, an MVP is named and other accolades are awarded to players who performed well. This all happens so fast that it’s easy to miss though. Perhaps a longer results screen would help the individual rewards feel a bit more substantial. XP is also dished out at match end, with medals earned through the match turned into further bonus XP which in-turn earns gear crates. It’s your standard rewards model; no reinventing the wheel here. It’s hard to get a grasp for the full OnRush online experience until Competitive Seasons are detailed. Quick Play is great and works like a charm but it’s key to understand how Codies intends to keep players coming back for more. The game will live or die by how fast it can build a steady community. The fundamentals are here though with a rapid matchmaking system and painless process to play with friends. There’s no doubt that at least 50% of the audience reading this review have already audibly scoffed at the description of OnRush. It’s hard to blame these people because for all intents and purposes this is not a racing game. Far from it, actually. Every mechanic, gameplay option and customization element seems to come from a completely different genre. This is true but that’s one of the reasons that the game has won me over. I’ve never experienced anything like it before, it’s totally unique and that will scare some out the gate. Unlike most arcade driving games, the gameplay loop here is far from simple. For the first few hours, it may feel like you don’t have a clue what’s going on with the chaos a bit too overwhelming. Don’t worry, this is normal. Initial impressions may also feel like each vehicle class doesn’t really matter (and the damn Blade is OP) and holding in boost for the entire round will seem pointless too. It’s when you take a step back though, and consider what each class and mode’s objective is that the game truly shines. Vehicle classes in the game include eight distinct categories that all have different passive, reactive and Rush abilities. The Rush abilities are essentially ultimate skills seen in the likes of Overwatch, DOTA and League of Legends. They bring a unique skill that can make or break a match. The type of ability each class has is intrinsically linked with its role in the stampede. There’s offensive vehicles like the Blade and Charger, which both encourage aggressive play during a match. Then on the other side, there’s the Dynamo. This is a vehicle that provides boost and Rush meter replenishment to nearby allies almost like a medic. Once more strategic team compositions start to come into play, this will be an important piece of the puzzle. It’s a meticulously thought-out roster that will inevitably need balancing as the game’s meta starts to form. The good news is that initially there doesn’t seem to be a blow-out class that makes any others redundant. There will be scenarios where a Charger can dominate but it’s up to the player to know when to make that all important shift to a Titan and make sure the team is shielded up for the fight. The test — and thus, this category of the review — isn’t just about controlling the vehicle but learning the individual traits of each class, track and mode. Speaking of vehicle handling, OnRush is a more rigid affair than one might expect. 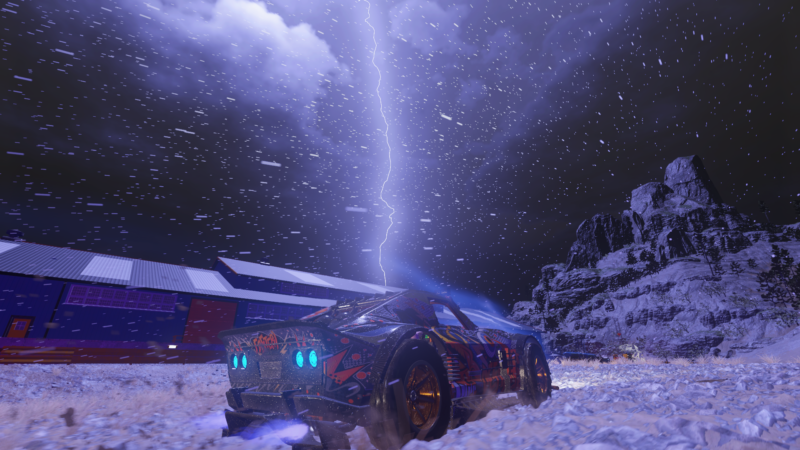 The aesthetics of the game probably make you think of crazy drifts and a very loose feeling experience. Surprisingly, this isn’t really the case. There’s a real weight to each vehicle and whilst you can pull off crazy stunts and maneuvers, it never feels scripted or unearned. You have to hit the angle right to pull off a barrel roll or calculate an attempted takedown. It’s not enough to carry speed into an opponent; if they have a heavier vehicle and have a superior contact point, you’re the one that will end up in pieces. This is frustrating at first (especially if you’re used to Burnout) but once you learn the underpinning elements of the physics engine, it will start to make sense. 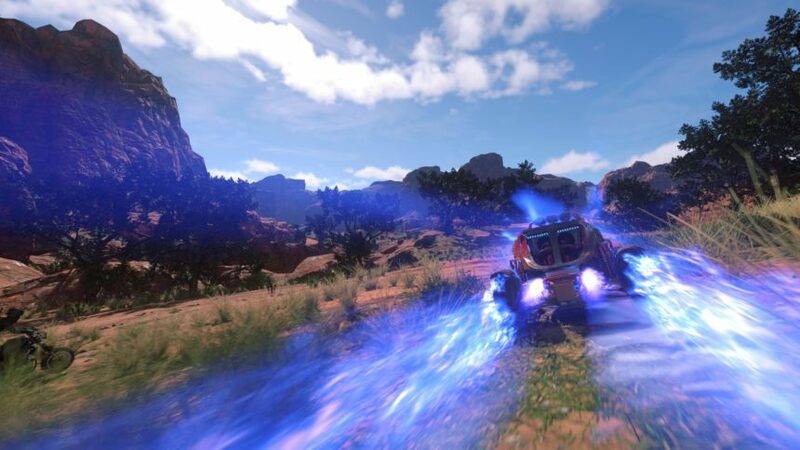 These elements come together to make a physics engine that isn’t supposed to stand out and define OnRush but rather never interrupt the gameplay. There’s a lot of strategic thinking and choices that need to be made but rarely does the handling ever get in the way. Once you get a firm grasp on how each class handles, that’s it. No need to worry about unpredictable behavior that could take you out of the experience. If OnRush was a racing game, you could say that this isn’t necessarily a good thing but it’s something entirely different and suits the style of play very well. There’s no doubt that the graphical caliber of Evolution Studios is being put to good use in OnRush. Taking the lessons learned from Driveclub, the latest game from the team is very pretty and runs like an absolute dream. We’re talking about 20 vehicles on the screen boosting through the air in the pouring rain as lightning cracks the sky. All at 60 frames-per-second on a base PS4. It’s utterly beautiful at times with fully dynamic time of day and weather creating some of the best photo-taking opportunities you can imagine. Vehicles and textures aren’t exactly amazing but the lighting engine and sheer attention to the environment makes it a real looker. On a purely technical front, Driveclub probably has the edge but OnRush hitting 60fps with the madness on screen arguably makes it more impressive. One to excite those who are big Codemasters fans is that this is actually running on the EGO engine, one game-powering technology that has really been needing an upgrade. If OnRush is anything to go on, this bodes very well for the future. A confident bustling UI also accompanies the visuals, providing a lot of information in a suitably streamlined format. 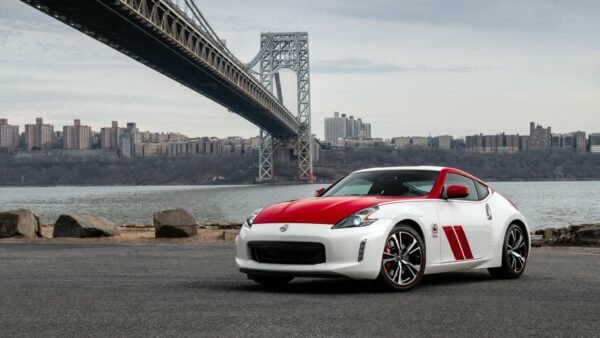 It’s daunting at first, especially if you only play racing games, but eventually the clean design becomes the norm. That’s because OnRush‘s entire presentation is incredibly slick. It’s unapologetically late 2000s and wears it in a way that would have you believe EA Sports Big had risen from the grave to offer fashion advice. Menus are rapid, so much so that you can take it for granted and not appreciate how good a job Codies has done. It takes a few button presses to choose a gameplay option and then under a minute to be playing. 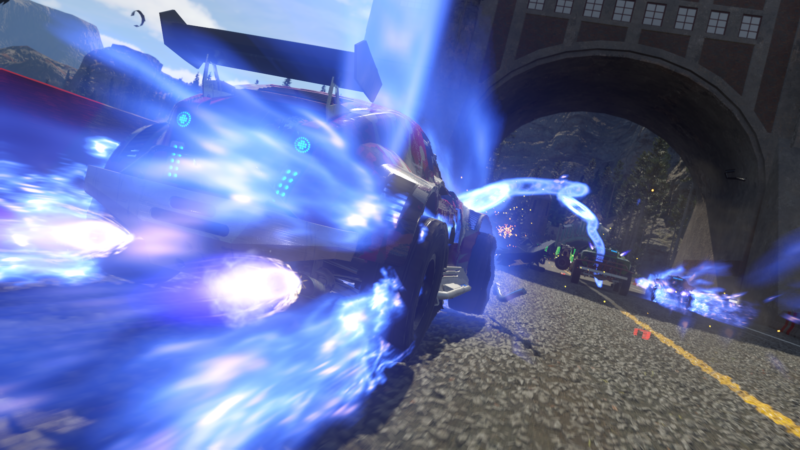 As a refined machine, arcade racers would struggle to top OnRush. One thing I would highlight is that the game’s in your face style is certainly not for everyone. Most racing games these days are more reserved or laughably edgy (looking at you, Need For Speed) but OnRush falls more on the campy side of the fence. It wants you to have fun and pulling off a 360 Knee Pump celebration at the end of the match might irk some people. It’s loud and proud and if you want to enjoy OnRush you have to deal with the presentation. Personally, I love it. It feels premium and backs up the gameplay loop that makes up the title. I can also understand why it might not appeal to everyone, though. At its core, OnRush is a tour de force of technical design. Boasting an impressive framerate alongside an insane amount of stuff happening on the screen at the same time, it’s hard not to feel the hype as you play. Photo mode enthusiasts also get a fairly in-depth screenshot tool as well, and with the dynamic ToD and weather every photo should look unique. Now comes a look at one of the best elements of OnRush. Every good arcade racing game in history has probably had an unreal soundtrack and sound effects. Codemasters has clearly taken this on-board for OnRush because everything about the sound design feels very unique. The soundtrack consists of a licensed set of tracks from the likes of racing game veterans like The Qemists and Coldcut. It’s a fairly standard artist roster but each song featured suits the on-screen action down to a tee. It’s what the team have done with the music that makes it stand out, though. An adaptive soundtrack tweaks and changes up the song playing depending on what is happening on the track. Perform a jump and the music fades whilst the vehicle noises increase, only to amp up the volume on landing. Anyone who’s played an extreme sports game will have seen this before but it’s still so satisfying. If you’re watching the wreckcam to see where you went wrong, the music stutters and echoes on car impact. Touches like these are in abundance, some obvious and others very subtle. It feels like the icing on top of the cake that completes the mayhem of the stampede. Codemasters has put together a list of hype-inducing songs from genres like drum & bass, pop-punk and rock. You’ll find an earworm that will stick in your head for days, regardless of taste (believe me, I know). On the effects front, the sound design team has really outdone itself. Every time the player performs a notable action in-game, a random voice clip will play to commend the action. It’s just bonkers enough to work but would feel out of place anywhere else but OnRush. That sums up the approach here: it’s a no regrets full-on audible experience. Keep the Spotify playlist for another day and just appreciate the tiny touches of detail that Codemasters has went to the trouble of including. Playing with headphones on also amplifies the experience even more. Vehicles sound pretty standard with an appropriate level of grunt but nothing particularly impressive. Look elsewhere if you’re hoping to find an engine noise showcase. If you’ve been waiting for something totally out of the ordinary in the racing genre, OnRush is for you. It really is a massive breath of fresh air in a realm where things are getting a bit predictable. However, I’m genuinely worried that it won’t find the audience it deserves. 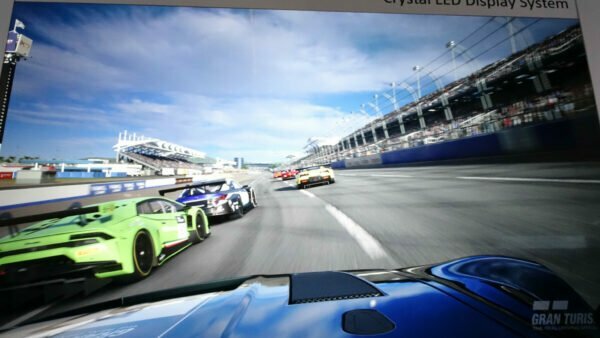 The decision to leave out a proper racing mode will irk mainstays of the genre and the outlandish nature of gameplay will make it a hard sell to the general public. That being said, OnRush doesn’t doubt itself at all. It fully commits to being its own beast and does so with a level of style others wish they could pull off. The marriage between Codemasters and Evolution Studios has created something we probably thought we’d never see. To sum it up, OnRush is a litmus test to see if the arcade genre can bring back games like Blur and Shox or remain tethered to more realistic offerings. There can be a middle ground between realistic racer and kart racer — Codemasters proves that with OnRush. It can succeed because it offers an impressive level of depth and fun that constantly keeps you in the action. There’s no settings to tweak, driving lines to learn or vehicle nuances to obsess over. The strategic elements comes down to teamwork, decision making and an ability to focus in a wonderful spiral of chaos. Conversely, this radical paradigm shift could also isolate it from the majority of gamers. It’s going to be an interesting experiment but after the week I’ve had with the game, count me in. The team has promised that release is just the beginning and players can expect future content throughout its life span. Ultimately, OnRush is a hard sell to anyone on the fence. You might enjoy it if you like racing games, you might like it if you play Overwatch. There’s no real way of knowing until you play. The beta did a reasonable job of showing off OnRush but it’s not indicative of the full experience. There’s a lot more impressive elements here that didn’t feature in the pre-release test. It’s a gamble for those who buy it and a gamble for Codemasters too, brushing away any and all expectations gamers might have had. This isn’t Motorstorm, Driveclub or anything else — OnRush is its own beast. Thankfully it works, and offers an experience unlike any other. Bring on the competitive seasons and I’ll see you in the stampede. Equal parts ambitious and disrupting, OnRush turns everything we know about arcade racing on its head with style and success. Adopting a ‘less is more’ approach, online offerings are addictive, simple and to-the-point. Partying up and matchmaking is rapid. A meticulously crafted vehicle class meta underpins a host of fun, strategic gameplay modes. Handling is serviceable for the core gameplay loop. OnRush is a well oiled machine running at 60fps with fully dynamic time of day and weather. An attitude-fueled presentation makes it stand out from the crowd. A hype-adaptive soundtrack merges well with good sound effects to keep the action exciting. Feels very 2000s, in the best possible way.